Sweet, crunchy, and satisfying are three words to describe this apple walnut quinoa salad. Packed with veggies, whole grains, beans, apples, greens, and nuts, this salad is a nutritional powerhouse. Not only do cinnamon and nutmeg boost the flavor of this dish and give it the sweet, tastes of fall, these spices also boost the antioxidant levels of this dish, even just by using a small amount. You might find yourself wanting to eat this for breakfast, and that’s perfectly okay! This dish makes great leftovers for quick easy meals or even a plant-powered breakfast! *For nut allergies, swap in pumpkin seeds. In a sauce pan, combine quinoa with 2 cups water. Bring the water to a boil and then reduce to medium-heat. Cover the quinoa and allow it to cook for ~15 minutes. Wash and chop the veggies. Sauté the onions and carrots in ~1/4 cup of water. Cook until the veggies start to soften. Then add in the zucchini, apples, cinnamon, nutmeg, and raisins. Use more water as need, but avoid submerging the veggies in too much liquid. Add in the beans and continue cooking until desired texture. 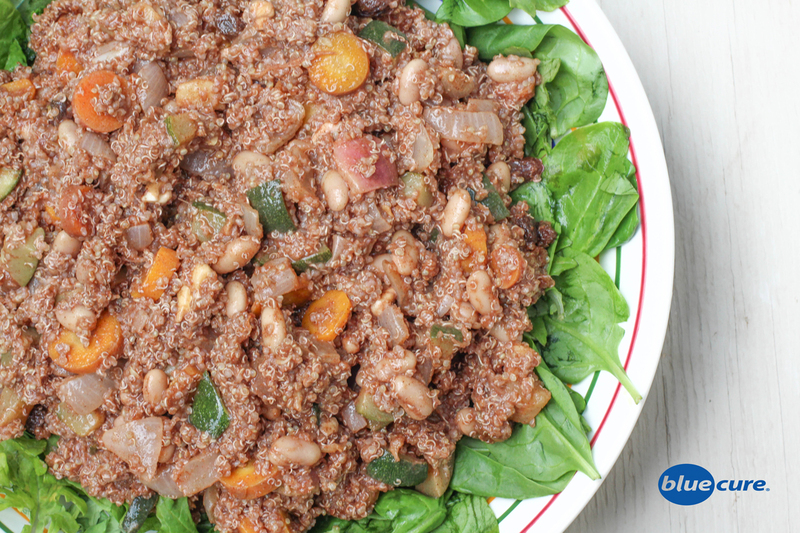 Once the quinoa is finished, combine the quinoa and the veggies in a large bowl. Toss in the greens and chopped walnuts. Serve warm or allow it to chill in the fridge prior to serving. Enjoy!